Do you think we are the passive observers of reality? Or do we bring our prior values, beliefs and habits to the every day co-creation of reality? I think we make our world, but we don’t make it from nothing. We co-create our world. What I create changes the world you experience. What you create changes the world I experience. Every day your experiences are unique. Whatever you experience today, remember this will be the very first time you experience exactly this. And, remember too, that this will be the very last time you will experience exactly this. Today will not come back again. Can you be aware of that? As you live today can you notice, sometimes, what kind of world you are creating? Can you notice what kind of world we are creating? This image is one of the ones which makes me very aware of the quality of light. 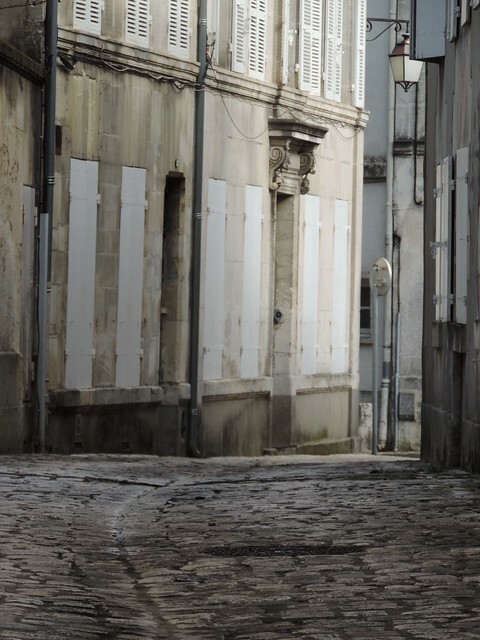 It’s a simple shot of a street in Cognac around mid-day, but I find the light quite magical. Isn’t it interesting how different the light appears depending on the time and place? I’m a great fan of diversity, so here are some very different examples, all taken in early afternoon light, but all on different days and in different places. 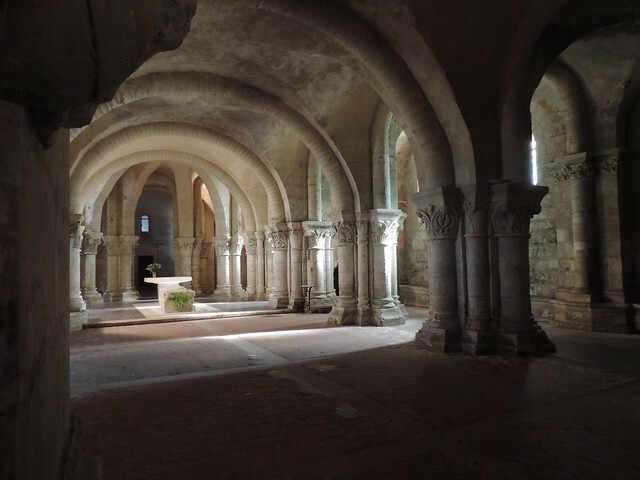 First up, here’s the Saint-Eutrope crypt in the town of Saintes. 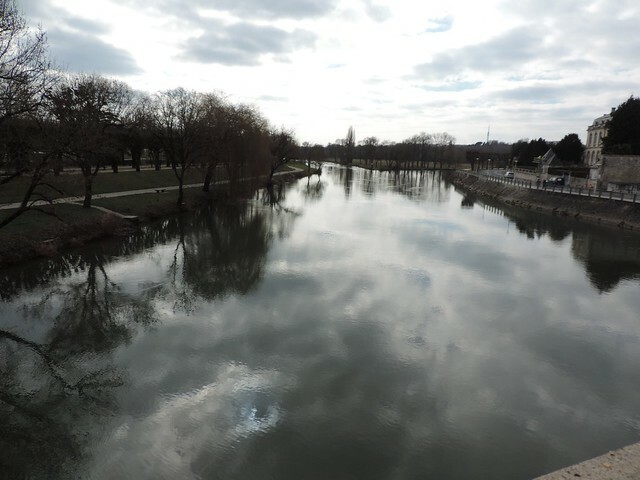 Then, the Charente river as it flows through Saintes. 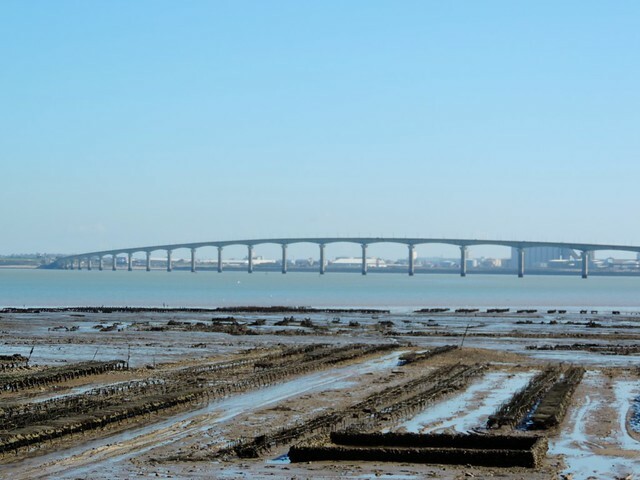 The bridge to Île-de-Ré, with the oyster beds in the foreground. When I loaded this image up onto my Mac, and looked at it, I jumped. I was taking a photo of the seeds hanging from the tree, but when I looked at it now I could see a skinny dark figure watching me. The figure looked cloaked and hooded to me and had seemed to step right into my field of vision, even though I had not seen him when I was taking the photograph. Was it a spirit or ghost of some kind? Out in broad daylight? What was it doing there watching me? Was it watching with good will, or evil intent? 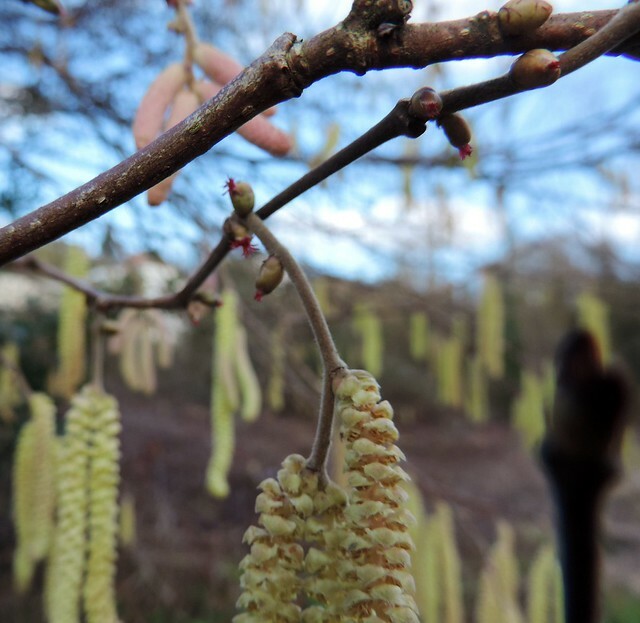 Then I looked again and saw the out of focus foreground twig which must have been sticking up in front of my lens. But when I look again, the first thing I see, every time, is the dark, shadowy figure. We bring our active imaginations into our every day perceptions. It happens automatically. Then, when we pause, stand back, and look again, everything changes. Last weekend the Atlantic coast of France experienced “les grandes marées” – high sea levels with spectacular waves and the risk of flooding in coastal towns. 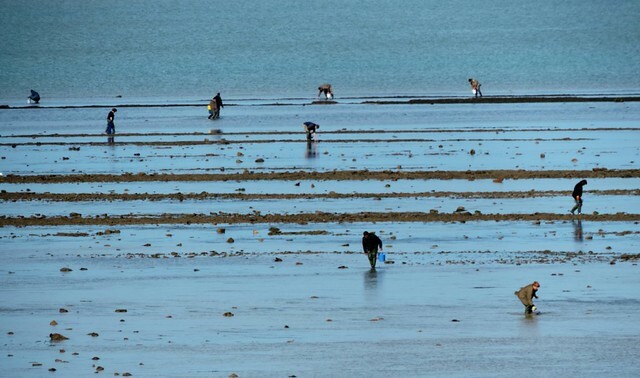 After the high tides recede there is a bumper crop for fishermen and others seeking seafood. I took this photo on the Île-de-Ré and now that I look at it, it reminds me of a musical score…..almost as if the people are the notes! Two ways to think of “composition” I guess. 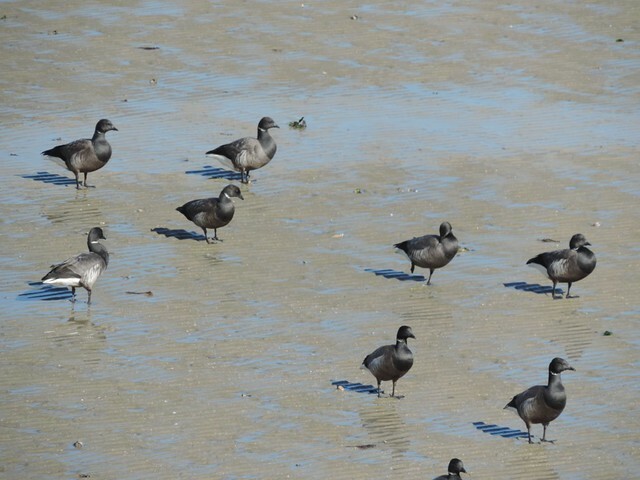 It wasn’t only people out taking advantage of the receding sea….. I call this blog “heroes not zombies” because I think so many of us go through much of our lives on autopilot. You know the kind of thing where you travel from home to work, or to a local shop or school, and when you get there you realise you’ve been thinking about something all the way and you actually have no recollection of any detail from the journey. Scary, huh?! We easily create habits for ourselves, always sitting in the same seat, or taking the same route to town, or ordering the same drink in the same cafe…….not that habits are bad in themselves, but they do take the consciousness out of choosing. They are another way of slipping into autopilot. We are controlled that way too. Our societies might claim to be free but they are based on mass markets, on global brands and services. We are “normalised” and “socialised” to “fit in”. Uniqueness isn’t encouraged. In health care drugs are prescribed on the basis of research conducted on groups which is used to create protocols which patients are plugged into on the basis of a diagnostic label. The Romans had a phrase for this – “bread and circuses”. They knew how to create a zombie society where citizens would conform. Two basic techniques – bread ie make sure people don’t go hungry, and circuses ie entertainment which provides distraction and absorption in what isn’t important. Using these two they could go a long way in the creation of a compliant populace. Of course they used other techniques too – not least fear and violence – great control measures. 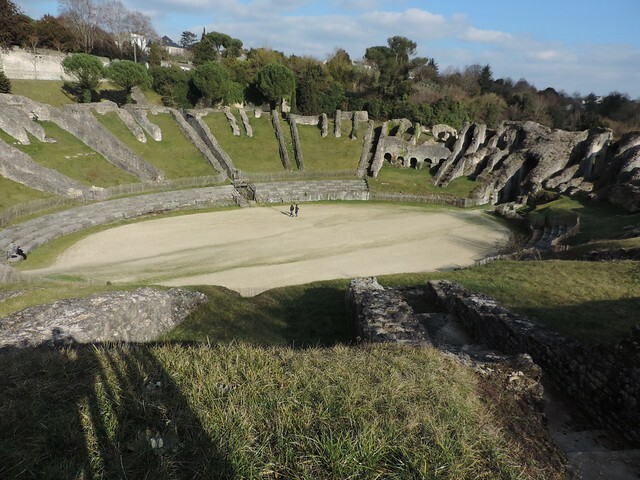 The amphitheatre I photographed above was a key venue for bringing all of that together – food, entertainment, fear and violence – all in one place! What’s the modern equivalent? Industrial scale “food” production, highly processed, loaded with sugars and chemicals of no nutritional value, and mass media “entertainment” with a focus on “celebrities” and “reality TV”. Add on top plenty of scare stories to keep the population afraid and daily threats of violence through the mass media. Seems to me the formula still works. But there is an alternative. Every single one of us is an individual with a unique story to tell. That story makes sense of our lives, creates an awareness of who we are, and sets us in our unique contexts – of place, of family and of tradition. That story gives us the ability to hope, to imagine and to aspire. It gives us a direction. And YOU – yes, YOU – are THE hero of your story. You are the main protagonist. It’s you who chooses, you who accepts or avoids the challenges, you who grows and develops. So there we have it. We don’t have to succumb. We don’t have to sign up to the zombie creation programme. We can be the heroes of our own stories, and, so, of our own lives. Well, you could start by taking a look around at the articles on this site. Check out the A to Z of Becoming posts for example. Read the posts on “story” or “narrative”. Or just come back periodically and read what you want to read. There is something dramatic about rain clouds passing through. 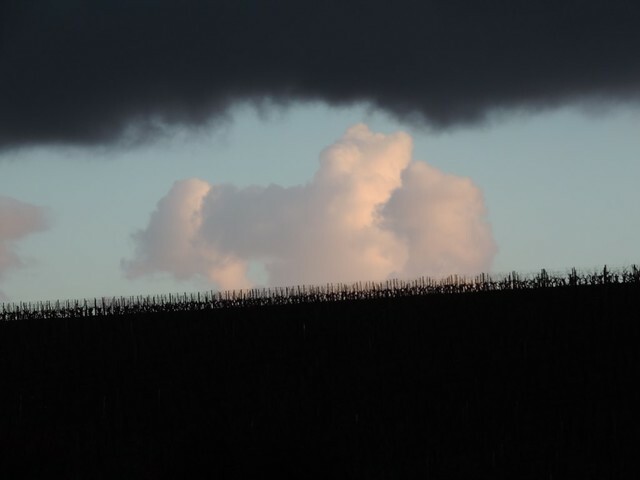 But what really caught my eye here was the contrast – the contrast between the dark vineyard and the blue sky with the soft white clouds, and the contrast between that part of the sky and the dark, heavy, rain-laden cloud above it. We need contrasts……bright, fine light and deep darkness too. The rhythm of light and darkness experienced by us all grounds our very existence not in constancy and sameness, but in perpetual change and difference. In the A to Z of Becoming, one of the verbs starting with G, is GO! 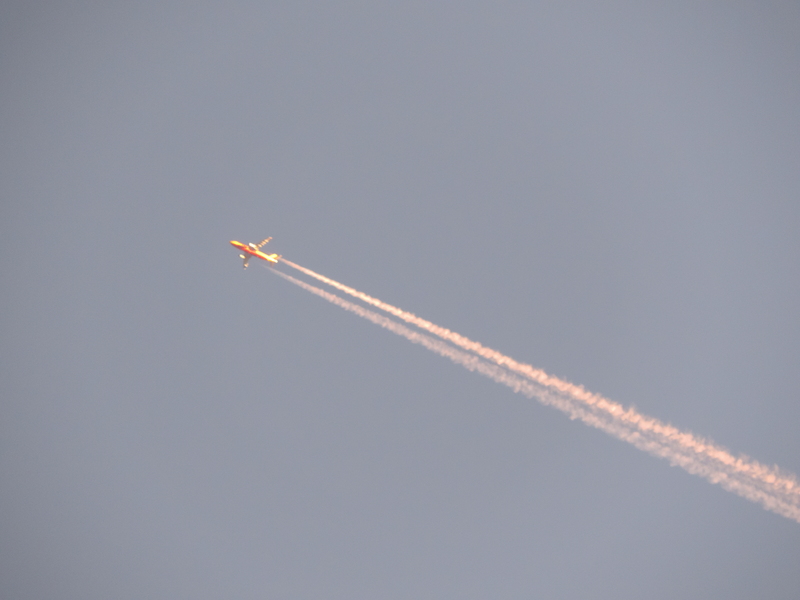 Every day I look up into the sky and see a mass of jet trails as planes fly from south to north, north to south, and sometimes in other directions too! I often wonder where the people are going. Where are you going to go this year? Physically. Are you going to go back again to somewhere you’ve been before and visit it with fresh eyes? Are you going to go and explore somewhere you’ve never been? I love to travel. It always changes my world, gives me a chance to reflect from a completely different vantage point. I hope you can have that experience too. I don’t think you need to go far to have that kind of experience, and I don’t think you necessarily have to make it a long visit. Even a day trip can be not only a pause, but a turning point. Just choose somewhere different from where you usually live, and GO! But thinking about this verb, “go”, brings up something else for me too. Not just travel and visiting different places, but doing what your heart longs for. What does your heart long for? What are the dreams you have for this life? Have you started to listen to what your heart says? Have you started to give the universe the chance to make your dreams come true? None of that is going to happen if you are just waiting…..waiting for the “right” time, the “right” opportunity, or until this or that other thing happens. It’s never going to happen unless you start. So, make this week be the week you hear “GO!” – and you are off and running!